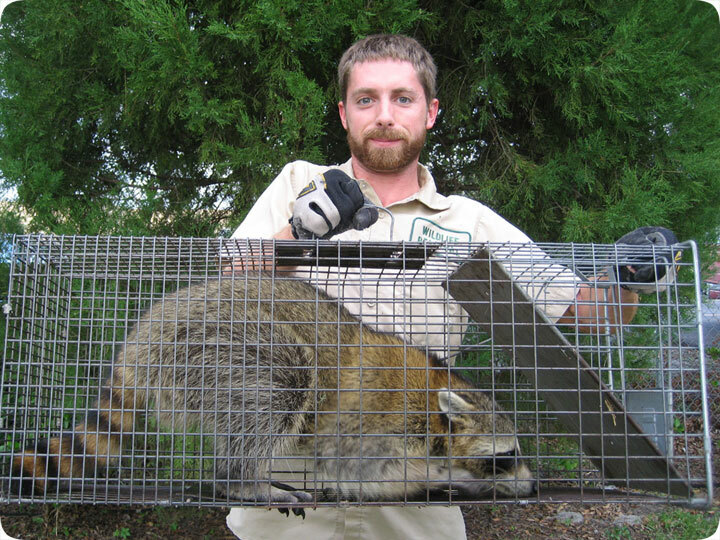 03.16.2005 - This is a larger-than-average raccoon for the state of Florida. Most of the raccoons down here tend to the small size, with adults averaging about 9-10 pounds. This one was 16 pounds. Not huge, but a good size for this area. It was doing a common raccoon faux-pas: pooping in a swimming pool. Raccoons love water, and they like to splash around, and wash their food (their name means "washes with hands") and they also like to poop in water, just like people! The reason is to hide the feces, I suppose. So they go on the shallow step and poop there. The homeowner was fed up: "I'm tired of these damn things crapping in my swimming pool!" he hollered, "I want to kill them!" I told him I'd be right out to solve his problem. I came to the home and set a Havahart live cage trap. "How is that going to kill the raccoon?" said the grumpy man. "It won't", I replied, but it will catch it, and then I assure you that it won't come back. "It won't come back as in you're going to shoot it once it's caught?" he said. "No," I replied, I'm going to relocate it more than ten miles from here, and it will never find its way back. He seemed skeptical and as grumpy as ever, but I assured him that this would solve the problem of the poop in his pool. Sure enough, by the next morning I had caught the animal. The grumpy man looked at it and said, "You won't be pooping in my pool any more, will you?" but I noticed what appeared to be a small smile on his face, and I think he liked the raccoon a little bit, and didn't want to kill it after all. I put it in my truck and last night I relocated it about 15 miles from the capture site, at an undeveloped wildlife reserve outside the city. It ran away unharmed. There's no need to kill raccoons if they are causing you a problem, no matter how frustrated you are. They can be easily trapped in a cage and relocated. And sometimes, all you have to do to stop a raccoon problem is to take away whatever is attracting them in the first place. I gave the man a board with a hundred 2-inch nails pounded through it, and all he has to do is put this on the steps the next time another raccoon comes calling to do its business, and it won't be able to walk on the steps. Why didn't I just do this in the first place? Well, the man insisted that I at least take the critter away, even if I wasn't going to kill it.